It's Facebook Fridays! for June 12, 2015, and it's time to drive evil-spirited people out of your life! If you've had it up to here with gossip, slander, and just plain meanness, then you need the power of Run Devil Run on your side, for as it says in Psalms 9: "The wicked is snared in the work of his own hands." 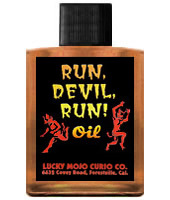 The Lucky Mojo Curio Co. is hosting a random drawing to give away 3 Run Devil Run Spiritual Supply prizes to clear away the Devil and all his imps. 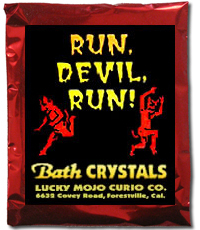 This week the prizes are three Run Devil Run power packs, each complete with Dressing Oil, Bath Crystals, Incense Powders, and Sachet Powders. First thing tomorrow morning, we will select THREE winners at random, announce their names here, and ask them to message this Facebook Page with their mailing addresses, so we can send them their FREE Run Devil Run products. We have a winner! In fact, we have 3 lucky winners! Our Facebook Fridays! winners for June 12, 2015 are: Erika Davis, Cheryl Hall, and Keisha Nicole Browder.